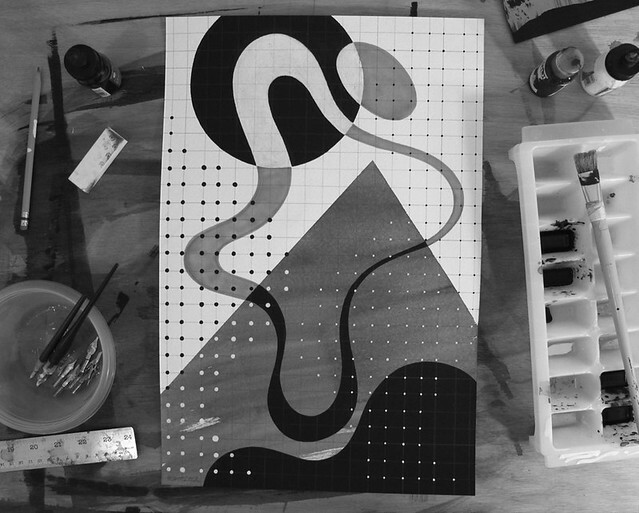 MWM NEWS BLOG: Winter B/W Series : Work In Progress # 1. Winter B/W Series : Work In Progress # 1. I've been focusing a lot of energy in the past weeks on my annual B/W Series. It's very satisfying to slow down the pace and paint in greyscale. This year is the 7th chapter ( 6 + 5 + 4 + 3 + 2 + 1 ) and as always I set a few parameters to work within so the series as a whole will stand together well. All of the art will be on 12x18" watercolor paper (white & black). I am using a combination of wet/sloppy techniques and clean/precise illustration styles. Here's a batch of Background Layers drying before they get more action. Thematically I am trying to simplify compositions and get the point across with less details than in previous chapters. Aesthetically I am experimenting with unique ways of creating depth like these dot grids.